Whisk together the flour and buttermilk in a large glass or stainless steel bowl. Cover lightly with plastic wrap or a plate and allow to sit on the counter in a warm place for 12-24 hours. Stir in the egg yolks, syrup, melted butter, and salt. In a clean bowl, beat the egg whites with a pinch of salt until stiff. Carefully the fold the whites into the batter. Cook in a waffle maker according to machine directions. While waffles are baking, wash out the egg white bowl and beat the cream and sugar until fluffy. 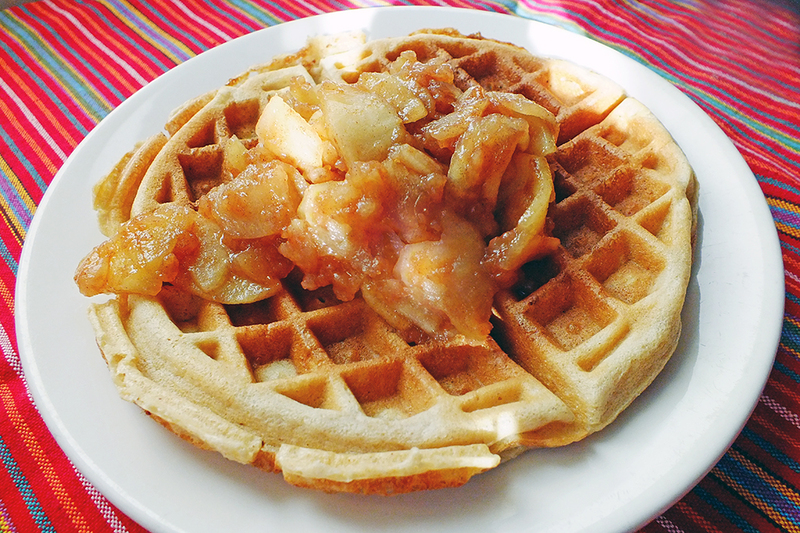 Serve waffles with warm apple compote and lightly sweetened whipped cream. Place all ingredients in a heavy saucepan over medium-low heat. Cook apples, stirring occasionally, until softened, about 30 minutes.